Mickey's Vacation Hideaway is the holiday home of your dreams! Centrally located just minutes from Disney World, Sea World, and Universal Studios, your adventure begins as you enter the beautiful gated community of Terra Verde which boasts a stunning clubhouse complete with an exquisitely large walk-in swimming pool and spa, as well as exercise, game, and reading rooms with a lakeside view. Your adventure continues in your stunningly furnished 6-bedroom, 5 1/2-bath executive vacation home with retention pond view. The home includes 4 master king suites with private bathrooms. Each suite sports a 42-inch high definition television with DVD player. Two other bedrooms include dual twin beds and 26-inch high definition TV's with built-in DVD players. With the exception of the game room, the home has tile and wood flooring throughout - to alleviate allergens for those who may suffer from allergies. 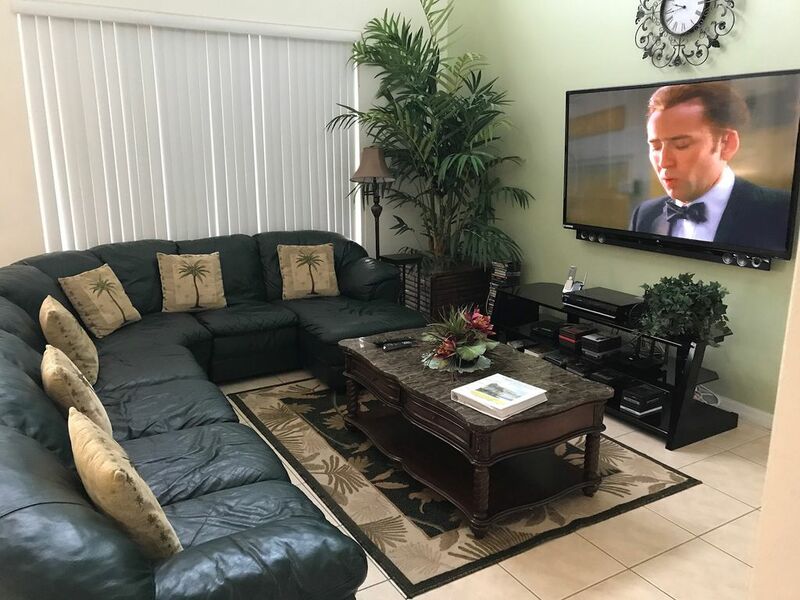 The family room includes ample seating to enjoy your favorite blue-ray movies on a 70-inch high definition widescreen television complete with a free Netflix account. The sparkling pool and spa invite you to enjoy the Florida sun or you can choose to escape the north-south sunshine under the large covered patio. If you like billiards, the Coke-Cola themed game room has a professional 8-foot slate pool table, and also includes a large air hockey table, foosball table, and seating for those cheering on the games. Other amenities include tropical themed decor, wireless wi-fi, free international calls to most Countries, ample seating for dining and relaxation, fully stocked kitchen, baby crib, high chair, and patio grill with built-in patio refrigerator. Most importantly, the home's Welcome Book contains information about the home, emergency contact numbers, and other safety information. Should any difficulties arise, the home's Property Manager has a 24/7 support line, and the Owners are dedicated to ensuring that you have a wonderful stay while in the home. With all these luxuries and plenty of shopping and restaurants within a 3-mile radius, Mickey's Vacation Hideaway truly is your best choice to experience your dream vacation! Pool Table, Air Hockey Table and foosball. All floors are ceramic tile and wood. No carpet, good for low allergy environment. House is spacious and well stocked. Pool/lanai area is great. Nice location. The owner was quick to respond to any questions. We'll certainly recommend this rental to others. Thanks for allowing us to stay! My family had an amazing time! The house and resort were a perfect vacation get-a-way! We can't wait to do it again! Home met all of our needs. I can say that both our children and grandchildren used the pool and hot tub extensively and thoroughly enjoyed all the time they could in both. It was the biggest attraction for them. Home met all of our needs and was comfortable during our stay. Our sincere Thanks to the responsive owners for allowing us the use of their home. Family vacation to Disney 6 adults 3 children and an infant. House was very comfortable and extremely well equipped. Shopping close by and a short drive to Disney parks. Would definitely recommend and would stay there again. Need I say more...WE LOVE IT!!! This Beautiful Executive home is located in Kissimee off of Poinciana Blvd. The location is ideal for people who are visiting more than one park. Its location is between Disney and Sea World, which is 10 minutes to either park. Terra Verde Resort is a well known Resort, 24 hour guard gated community, with a beautiful clubshoue with all the amenities.